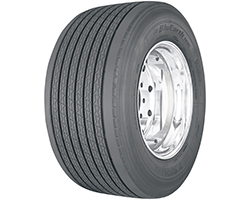 Yokohama is going the extra-mile—literally—to help the bottom line for fleets and independent drivers with the launch of two new super fuel-efficient trailer tires: the BluEarth® 109L and BluEarth® 109L ultra wide base (UWB). Available March 1, 2018, in the U.S. and Canada, the two SmartWay®-verified tires will also be on display in the Yokohama booth (#2821) at the TMC show in Atlanta, Georgia, March 5-8. Manufactured in Yokohama’s new plant in West Point, Mississippi, the 109L will be available in four sizes – 295/75R22.5, 11R22.5, 285/75R24.5 and 11R24.5 – while the ultra wide based version will be offered in a 445/50R22.5. -- Superb fuel-saving performance is achieved by a state-of-the-art compound that provides one of the lowest RRCs in the category without sacrificing treadwear. Also, an optimized tread pattern with seven circumferential grooves rolls smoothly for improved fuel-efficiency, and a highly durable zero-degree belt assures a consistently stable footprint for long, even wear. -- Improved traction and service life is a reality thanks to optimized sipes which greatly improve traction for powerful braking in acclimate weather. Plus, the casing construction is so tough, the 109L UWB is backed by a six-year, three-retread warranty. -- Robust construction is provided by Yokohama’s all-new advanced stress control groove design, which resists shoulder damage from sharp turns or accidental curbing. Additionally, the innovative tread pattern fights scaling in lateral slides (common in tight maneuvers), and thanks to the ultra-durable casing, all sizes of the 109L are backed by a seven-year, unlimited tread warranty. -- Enhanced fuel-efficiency is insured by Yokohama’s advanced compound that fends-off wear, as well as compact tread blocks that roll smoothly for great fuel savings, while the five-rib design assures superior traction. More details on Yokohama’s commercial tires at www.Yokohamatruck.com.